MOSCOW: Russian President Dmitry Medvedev will talk up the benefits of restraint in the Arab world and push for new rules on nuclear safety when he attends a key world summit in France this month. On May 26 and 27 the Kremlin chief and his counterparts from the Group of Eight (G8) wealthy nations will meet for an annual summit at the seaside town of Deauville in Normandy. The high-profile get-together follows the Arab Spring tumult that earlier this year ousted autocrats and reshaped nations in the Middle East and North Africa, and the G8 leaders will put their heads together to come up with a common strategy for the region. “The centre of gravity (of talks) will lie in attempts to define what is happening there -revolutions, modernisation or the collapse of political regimes - and in deciding where the G8 can be useful,” said Viktor Kremenyuk, deputy director of the USA-Canada Institute of the Russian Academy of Sciences. Reaching common ground will not be easy, however, as Moscow and the West have advocated different approaches to the Arab unrest, analysts say. The West, the United States in particular, has encouraged the youthful masses seeking to win their freedom from tyrants and is currently involved in a military campaign against the regime of Moamer Kadhafi in Libya. Moscow is likely to be a discordant voice at the summit as it urges against interference in what it considers to be the domestic affairs of sovereign nations. “The discussion will be very difficult, based on the previous record,” Kremenyuk told AFP. In March, Medvedev risked worsening his relationship with Vladimir Putin, his prime minister and mentor, by ordering Russia to abstain from the UN Security Council resolution on Libya that essentially authorised military action. After the West launched a military operation in the North African country Medvedev accused it of exceeding the UN mandate and abusing Russia's goodwill. Russia said it would never support any possible UN resolutions to intervene with force in Moscow's traditional ally Syria and would scrutinise any such attempts through “a huge magnifying glass.” You have to give states an opportunity to choose their own path of development and to give the Syrian leadership an opportunity to settle the domestic problems that exist there,” Medvedev said. By comparison, US President Barack Obama has unveiled a multi-billion-dollar economic plan to reward democratic change in the region. Washington also asked the World Bank and the International Monetary Fund to present a plan at the summit for “what needs to be done to stabilize and modernize the economies of Tunisia and Egypt.” The summit will also give Russia's 45-year-old president a chance to speak assertively on other issues of global significance amid uncertainty at home about who will run for president in 2012 elections. 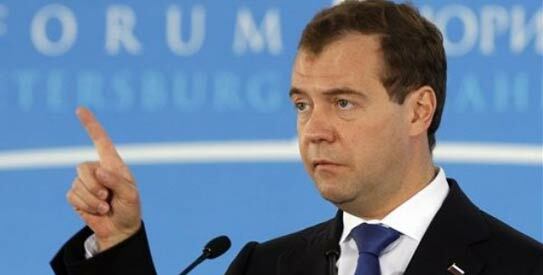 Analysts say Medvedev is keen to seek re-election but is expecting a nod from the 58-year-old Putin who shows no readiness to retire. “Medvedev plans to urge his G8 counterparts to adopt a new convention on nuclear safety taking into account the lessons of Japan's Fukushima nuclear disaster,” said a person familiar with the summit's agenda. Marking 25 years since the world's worst nuclear disaster with a visit to Ukraine's Chernobyl nuclear plant last month, Medvedev said Russia had drawn up proposals for a convention aimed at ensuring the proper development of nuclear energy. Vladimir Orlov, president of the Russian Centre for Policy Studies, a think tank that works with US experts on nuclear nonproliferation, expressed doubts the G8 was ready to discuss the new nuclear rules in earnest. “But no one was ready for Fukushima, either,” he told AFP. “There is a vacuum around nuclear safety. Answers are needed.” On the summit's sidelines, Medvedev plans to hold a separate meeting with Obama where he is likely to push for progress on missile defence. The Kremlin chief is also likely to meet French President Nicolas Sarkozy, German Chancellor Angela Merkel and Japanese Prime Minister Naoto Kan for separate talks.